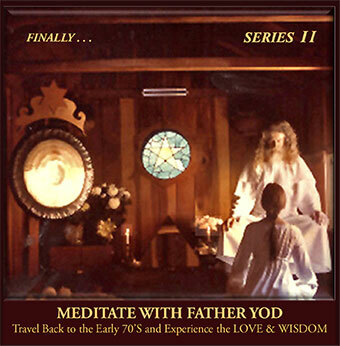 Meditate with Father Yod. Travel Back to the Early 70’s and experience Love & Wisdom. “Through these tapes, my voice will stay behind when I pass over- Long out living me. What would we be without records, written words and what we leave behind? It is a gregarious, tribal tradition to orally leave the wisdom and customs to the next generation. 27 sides approximately 25 hours of morning gatherings with teachings, laughter, fun, humor, music and family business as well as personal issues. You get to time travel back in time and hear it all as it happens the real deal from Father himself. It was the 1970’s where a cosmic “Alice in Wonderland” portal opened up in the L.A. area….and ANYTHING WAS POSSIBLE. These recordings were taken from 40 year old cassette tapes saved and housed in Isis archives. They have been re-mastered and now being shared in tape series collections. 28 sides approximately 25 hours of morning gatherings with teachings, laughter, fun, humor, music and family business as well as personal issues. You get to time travel back in time and hear it all as it happens the real deal from Father himself. It was the 1970’s where a cosmic “Alice in Wonderland” portal opened up in the L.A. area….and ANYTHING WAS POSSIBLE. 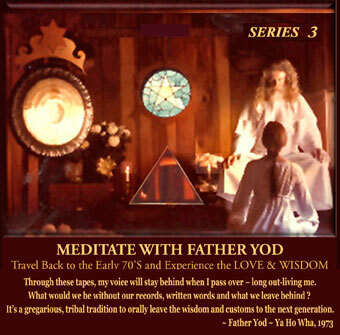 FATHER YOD AND THE SOURCE FAMILY MORNING MEDITATION -TAPE SERIES TWO….Approximately 30 hours of morning gatherings with teachings, laughter, fun, humor, music and family business as well as personal issues. You get to time travel back in time and hear it all as it happens the real deal from Father himself. It was the 1970’s where a cosmic “Alice in Wonderland” portal opened up in the L.A. area….and ANYTHING WAS POSSIBLE. Jim Baker, who was already a Hollywood legend, opens up his 3rd and final famous restaurant on Sunset Strip. He wanted to know what was happening and just who were these hippies/flower children and what was gonna on….He connected with them and ended up opening one of the first mainstream Organic vegetarian restaurants in the country called ‘THE SOURCE”. Became a student of Yogi Bhajan and then formed his own communal family/tribe called ‘THE BROTHERHOOD OF THE SOURCE” becoming the darlings of the L.A. scene. For about 4 years each morning meditation/class was recorded by Isis Aquarian who was the family Historian and one of Father Yods 14 wives. After Father Yod/Yahowha left the body in 1975 the family stayed together for two more years continuing having the morning gatherings to start their day. Father Yod and the Source Family adventure has historical and culture value that is now being embraced and shared by The Book and the Documentary recently released and with the start of this tape series, being offered through Global Recording with Karl Anderson. Thus enabling the legacy to be saved. AUGUST 25th, 1975 ~ FATHER YOD’S VOICE WAS HEARD NO MORE . . .
AUGUST 25th, 2011 ~ 36 YEARS LATER ~ HIS VOICE RETURNS ! Through the Magic of This ON-LINE LIBRARY . . . It was the late 60’s and early 70’s – a timeframe during which people wanted more ! They were just walking right out on their lives, in search of something higher and better . . . leaving the booze, prescription drugs, religious dogma and expectations – the brainwashing – of their parents. This was a historical timeframe in WoMan’s evolution and we were experiencing a “Crossover” – we were the forerunners of our time. If you have been feeling that we are now entering another “Crossover” . . . perhaps these words will ring the bell of truth for you !